This is similar to a standard issue link, but has some advantages, and disadvantages, versus an issue link. A disadvantage of using this field is that there is no reciprocal link available currently. In order to find issues linking to an issue you would need to execute a JQL query. 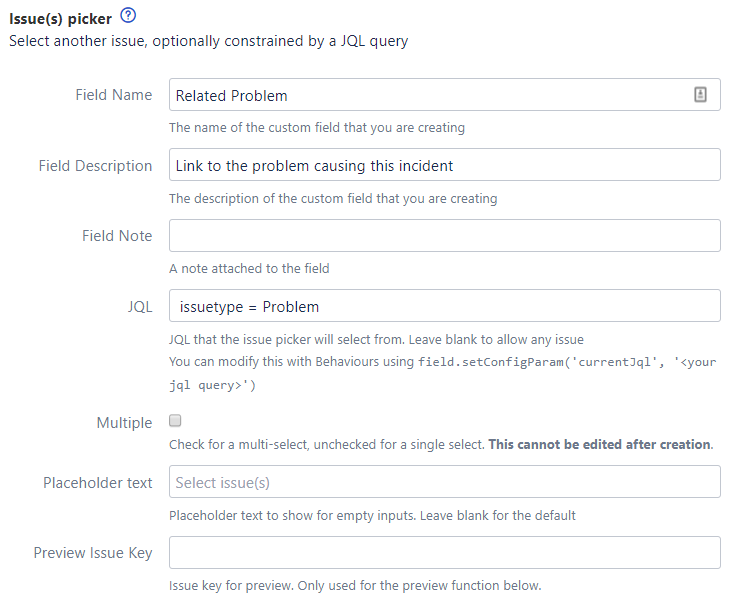 You can create additional field configurations for this field, with different project/issue type contexts…​ you can then modify the parameters such as the JQL query, but the plurality of the field must remain the same, you cannot have different contexts where you have a mix of single and multiple pickers. You can also use the IN, !=, NOT IN operators, or the basic search mode. If you retrieve or set the value directly on the issue, the result will be an Issue object, or if you have chosen a multiple issue picker, a Collection<Issue>.